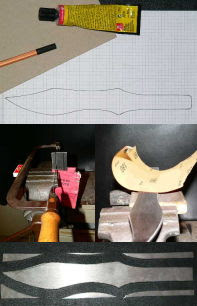 EN You have always wanted to make your own throwing knife, but didn't really know how to? Now there is no more excuse, just follow these photo instructions on how to make throwing knives. DE Eigentlich wolle man ja schon immer mal sein eigenes Wurfmesser bauen... Jetzt kann es losgehen, mit dieser Photo-Anleitung zur Konstruktion des eigenen Wurfmessers. FR Construire son propre couteau à lancer, c'est possible? Mais bien sur, avec ces instructions photos.